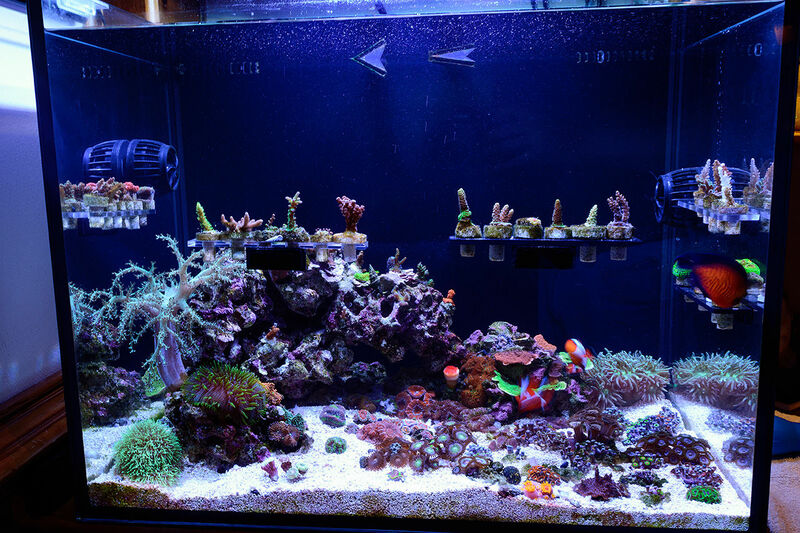 Congratulations to community member teenyreef and his 40 gallon nano reef for being selected for our June Reef Profile. 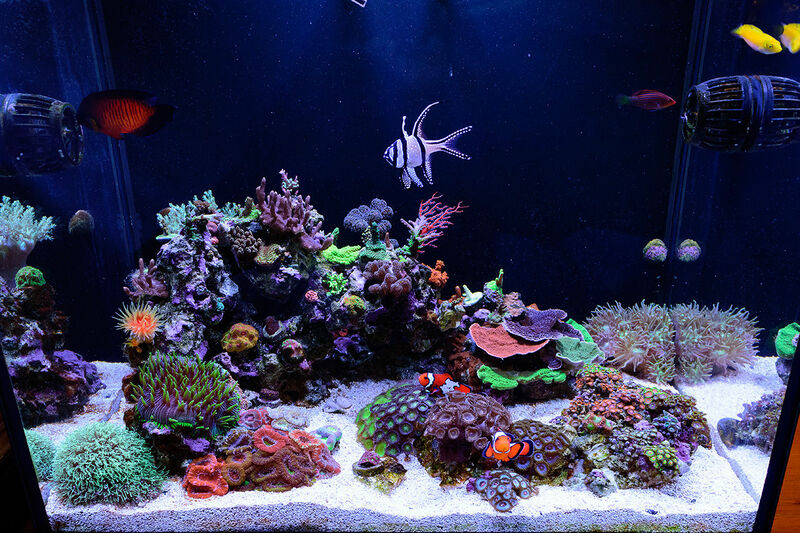 Below is the aquarium profile teenyreef has written for us sharing his experiences in the hobby and this aquarium's journey over the past two years! See what he's been up to and share your comments and questions in the comments section below. 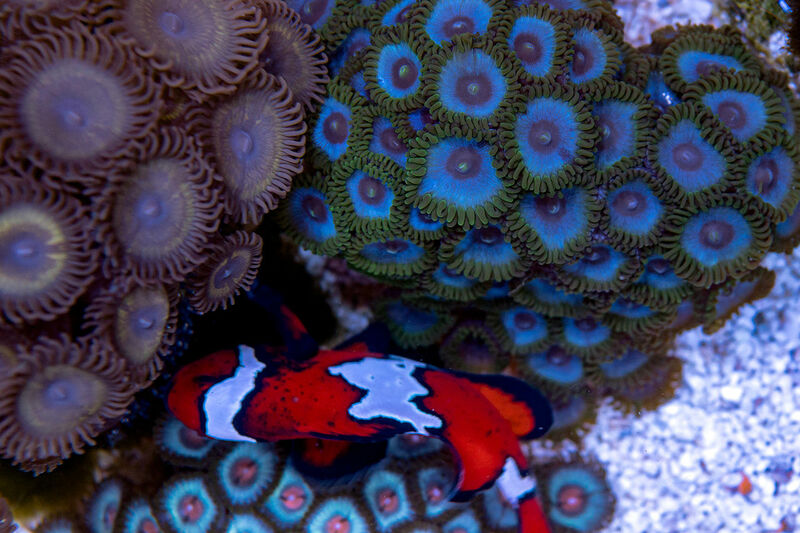 Be sure to follow his aquarium journal for additional photos, history, and information about this beautiful reef tank. Every 3-7 Days: Check Alkalinity and salinity, scrape algae, change filter floss, empty skimmer cup, turkey baste rocks and stir up the sand. Monthly: Check Nitrates, Phosphates, Calcium, and Magnesium. Stir up the water and detritus in the back chambers, clean media basket, and run fresh ¼ cup fresh Carbon for 3-5 days. 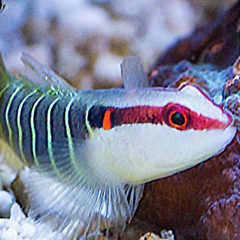 Daily: I feed daily with a mixture of frozen PE Mysis shrimp, PE Calanus shrimp, and Hikari Mega Marine Algae. 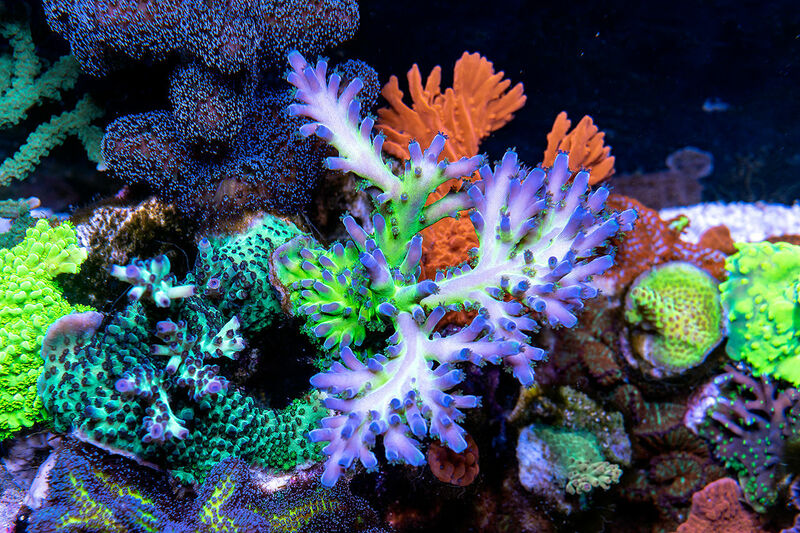 I also feed a blend of Brightwell coral foods (10 ml/day). 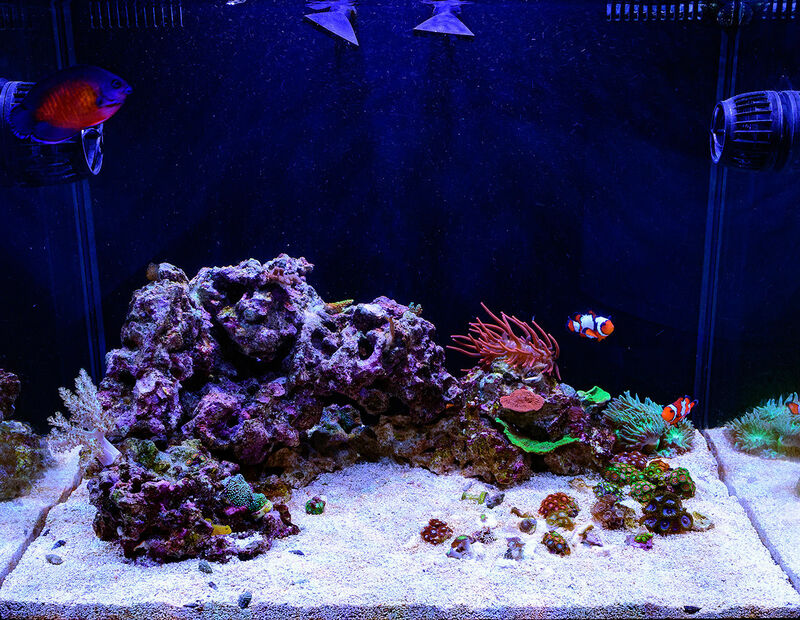 I got the basic recipe from Nano Box Reef’s Dave Fason: 200 ml RODI, 40ml Reef Snow, ½ tsp each Small and Large Reef Blizzard, 20 ml Reef Amino, and 50 ml Microbacter 7. Various acropora, tenuis, stylophora, etc., …more than I can count! 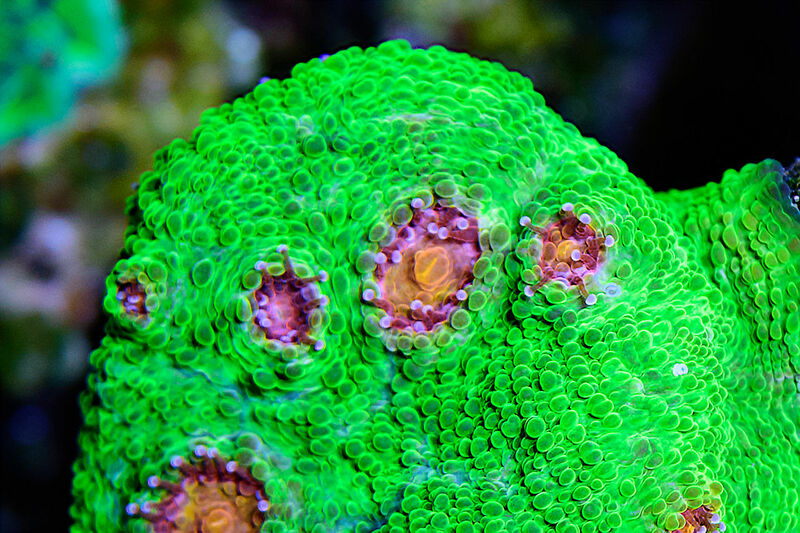 Montipora capricornis (Green, Red, Idaho Grape and other varieties), digitata, and encrusting. The idea for this tank came about after my very first reef tank, a 4 gallon pico (March 2015 TOTM), crashed. Instead of rebooting the 4g tank, I decided to move my 10g tank (August 2016 TOTM) to my desk and use the bookshelf in the family room for something bigger. 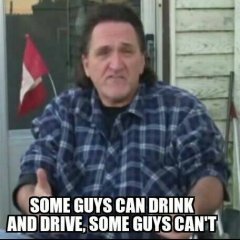 Like ten times bigger! The space available for the tank was 23 7/8" wide, 21 1/2" deep, and 25" high. Either the IM Lagoon 25 or the Nuvo 40 would fit perfectly, with about 1/8” to spare on either side. My goal for this tank was to keep a mixed reef with lots of SPS coral, along with as many fish as I could fit into the space, so I decided to go with the larger tank to have extra fish and more stable parameters. I started my tank journal thread before I had even decided which tank to use. I’m so glad I did, because I got lots of great advice about equipment, stocking, and how to get started. We had so much fun with that discussion that I didn’t even get the tank until page 6! I had good luck using uncured live rock in my 10g tank, so I ordered ten pounds of fresh live rock from KP Aquatics, and supplemented it with thirty pounds of dry rock from Reef Cleaners. I set up a couple Rubbermaid containers in the garage with power heads and heaters and fans, so as soon as the live rock arrived, I was able to put it in the water to minimize die off from shipping. Once the dry rock arrived and the tank was wet, I more or less randomly piled the rocks on top of each other in my initial scape, which was terrible. 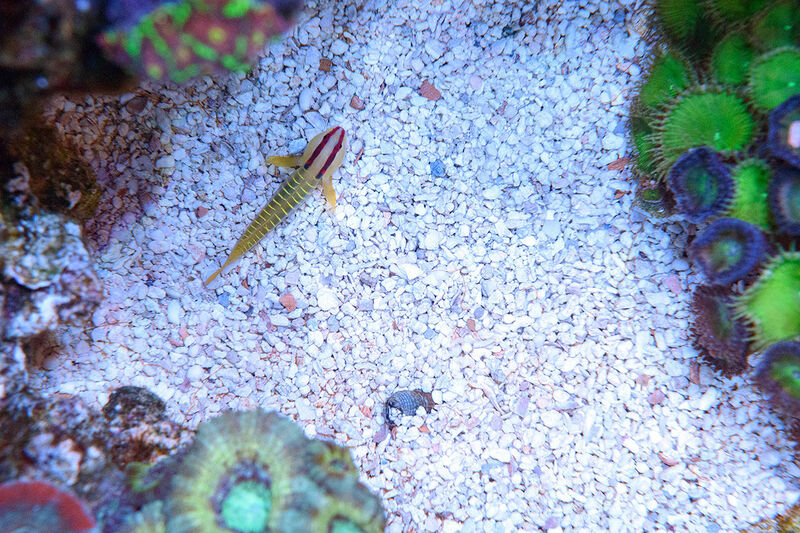 Later that night I got inspired by the shallow lagoon look of @4x5’s tank, and I removed about half the dry rock to create a much smaller crescent shape with an open sand bed lagoon, and then eventually stuck the rocks together with Emarco mortar. It worked out great – the mortar has held the rock together perfectly, and the live rock seeded the dry rock with no real cycle at all. And, finally, on page 12 of the tank thread, I posted a picture of the final aquascape. 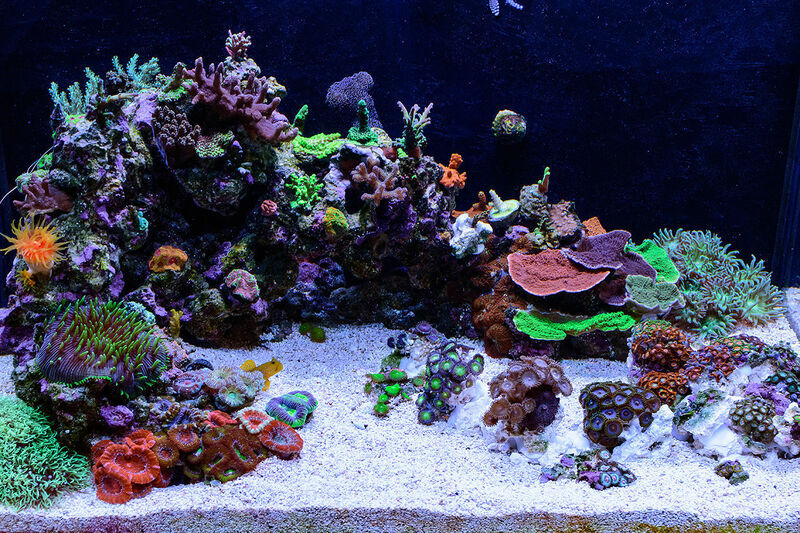 By the middle of June, the tank had snails and a new Wide Quad LED light from Nano Box Reef, and I started putting the first corals and fish in after the first month. From then on, I’ve steadily added more frags and more fish, until the tank looks as it does today. I’ve tried some new things with this tank, starting with my use of the ATI Elements system, which is a three part dosing solution that includes trace elements mixed in with the usual Alkalinity, Calcium, and Magnesium elements. With the this system, I don’t do water changes. The dosing replenishes all needed elements, and every three months I send in a water sample for testing, which tells me if anything is out of balance and needs correction. The system has been very successful in this tank, with no water changes since last September. The ATI testing measures both the tank water and my RODI water, so I can be confident that I’m not introducing anything bad when I replenish the automatic top-off container. While the dosing strategy has helped with coloration, adding supplemental T5 lighting has been the single biggest change I’ve ever made to the tank. Before adding the T5’s, I struggled with SPS having the “right” colors (everything was too green), and to many frags were dying or just not growing well because of the shading caused by having all the LEDs concentrated near the center of the tank. The Nano Box Wide Quad has four LED pucks, and provides very good coverage and fantastic color. 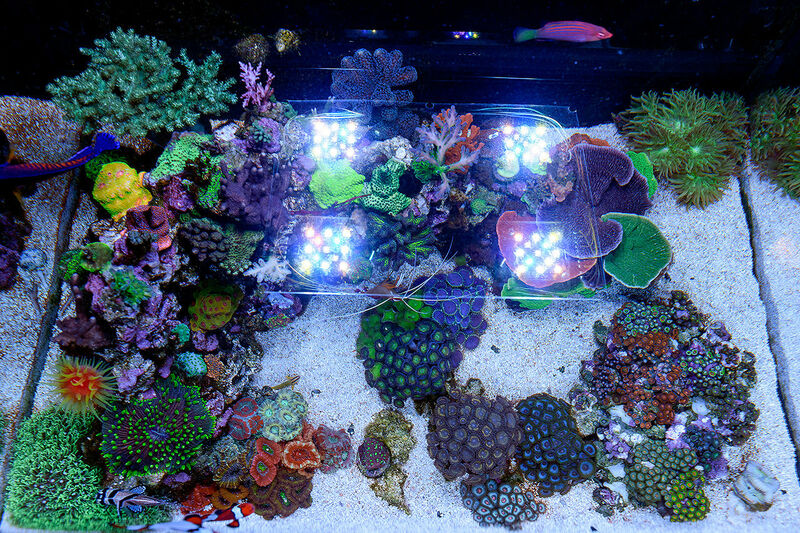 But LEDs just can’t provide the even coverage that T5’s provide, and after adding the T5’s and reducing the intensity of the LEDs (so that the overall PAR was unchanged), the SPS colors improved almost overnight, and all the corals are growing faster. I now believe that a combination of high quality LEDS and T5 bulbs is the best lighting option. I’ve never had any disasters with this tank (unlike my previous two). The most difficult thing I had to work through was a persistent problem with diatoms. Diatoms normally come and go in the first few months for any new tank, but mine didn’t go away until the tank was over a year old. It’s hard to say for sure what got rid of them, but I believe it was because I increased the NO3:PO4 dosing levels, which reduced nutrients. I have also lost a few fish. 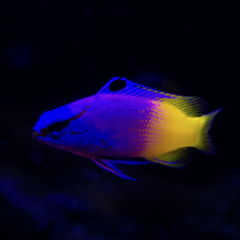 In particular, the Yellow Coris Wrasse that jumped out of the tank and somehow ended up inside the back of the cabinet under the tank was the strangest loss. 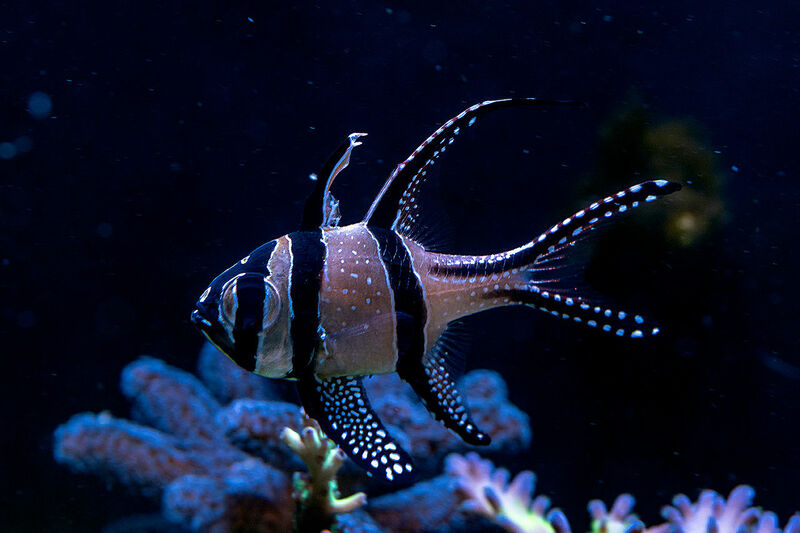 And recently, the Coral Beauty Angelfish suddenly developed swollen scales and died within 24 hours, which was very frustrating because he was one of the oldest fish in the tank and had shown no signs of distress. 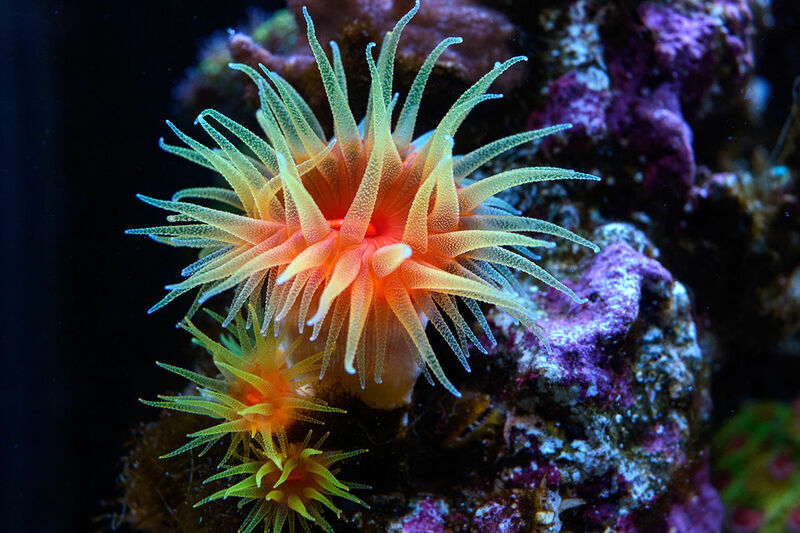 I also struggle with a particularly annoying variety of hair worms that can sting corals, and none of the fish or invertebrates seem to be able to eat them. 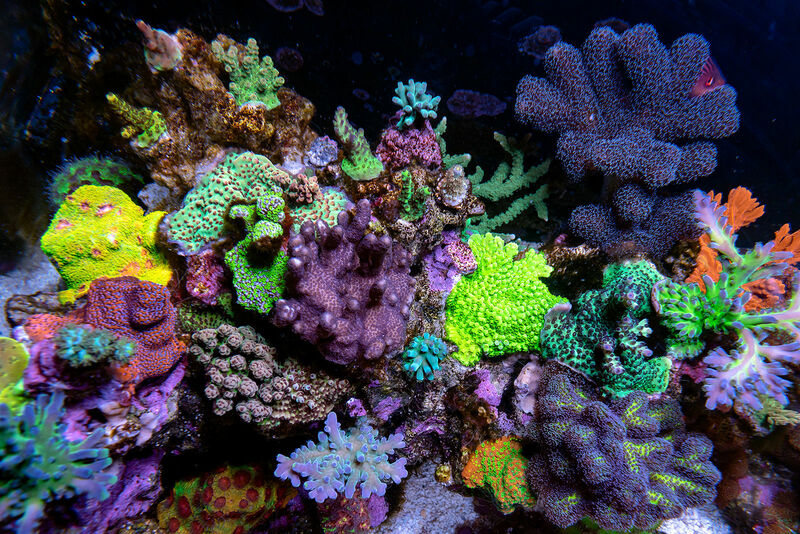 They have become established everywhere in the rocks and sand, and if you look closely you’ll see them in almost every picture of the corals in this tank, looking like unattractive and uninvited guests at the party. I blow as many as I can from the rocks with the turkey baster, but they seem to be here to stay in this tank. Finally, one of my biggest challenges recently has been the development of heavy, dark brown, hair algae. 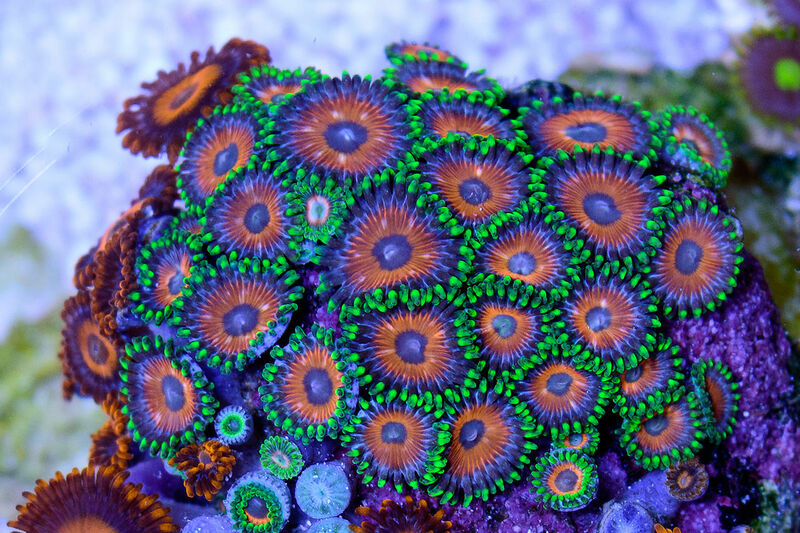 I thought I had it beat after adjusting the NO3:PO4 dosing levels again, but it’s bounced back with a vengeance, and has been suffocating the zoas on the zoanthid rock. This will be my next major challenge to overcome with this tank. 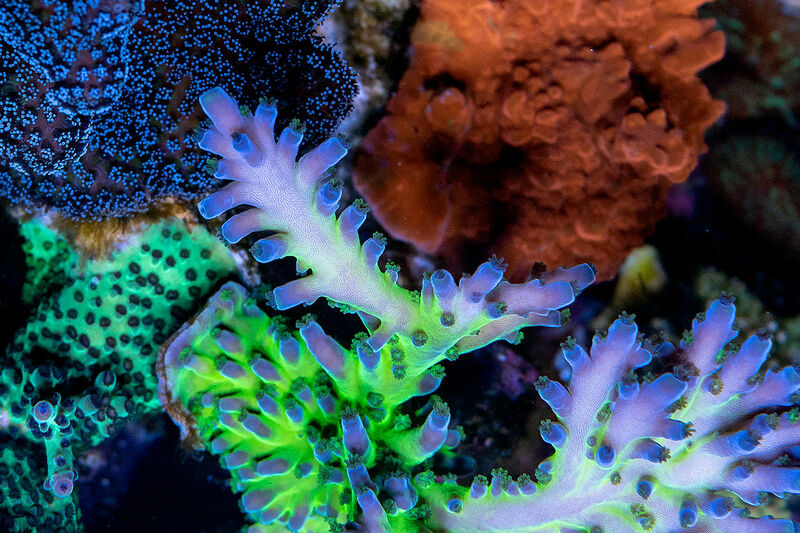 In the future, I will have to reduce the number of corals in the tank, as the SPS frags are turning into colonies and many of them are too close together to grow out. But for now, this is only a problem for the biggest colonies. 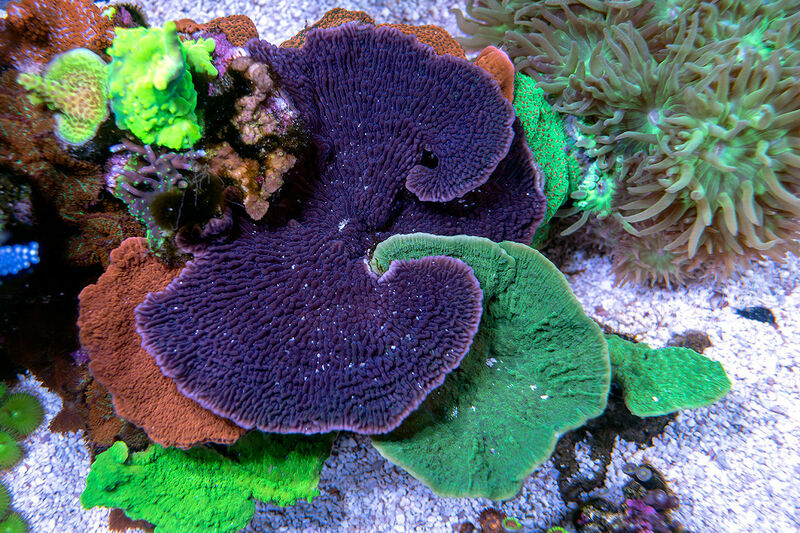 I expect having coral colonies get “too big” will be a great excuse for another tank upgrade! Automation is very important for me in keeping a mixed reef with lots of SPS corals. Without dosing and automated top-off to make up for evaporation, it would be almost impossible to maintain the steady parameters needed for SPS to thrive. 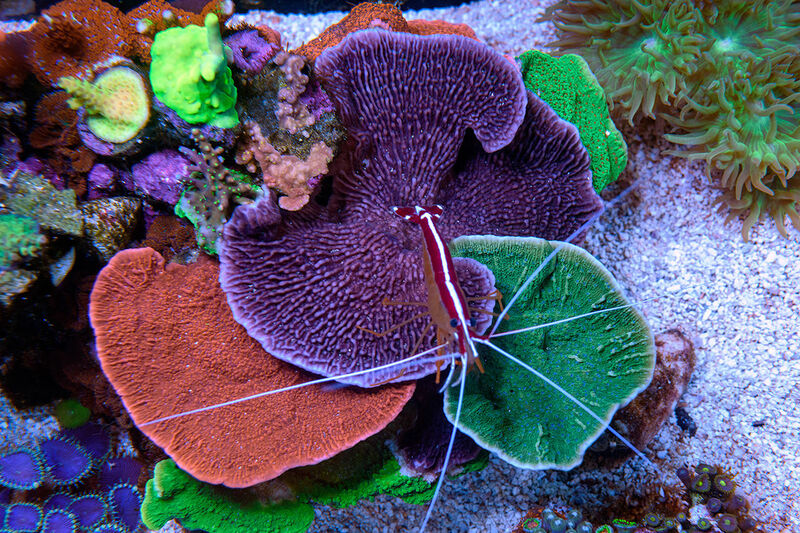 In this tank, nutrient control can be a challenge. 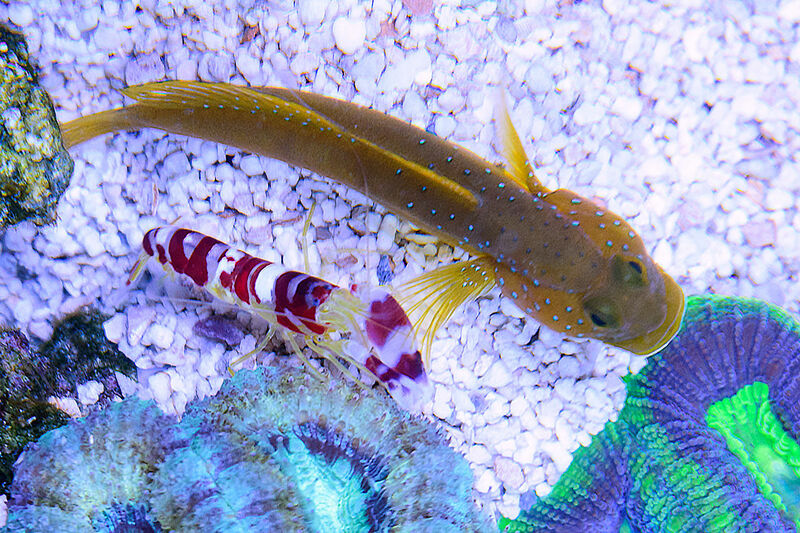 Keeping nitrates and phosphates low while giving fish and corals enough food to thrive is really hard to do. 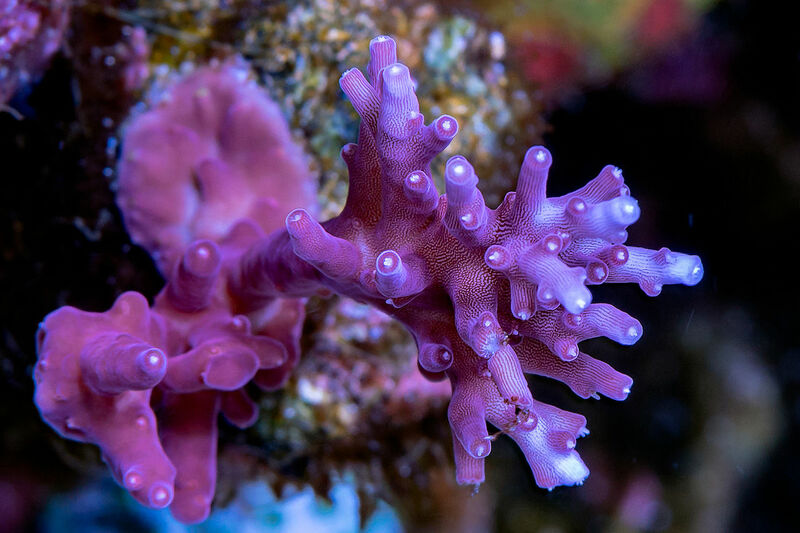 It would be easy to keep nitrates and phosphates under control by reducing feeding, but I’ve found that my corals really respond much better to regular heavy feeding. 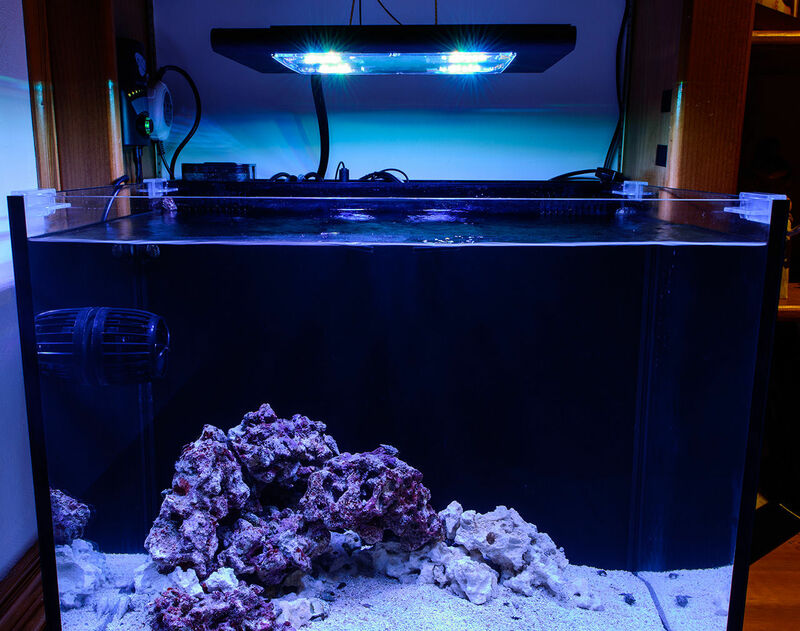 I’ve had a success using RedSea NO3:PO4-X (carbon dosing) along with skimming and occasional use of carbon to keep lots of nutrients in the water for the corals to consume, while also breaking them down quickly before they become a load on the tank. I have also been successful in using PhosphateRx (Lanthanum Chloride) to reduce phosphates, although I rarely need to use it. I stopped using GFO to reduce phosphates because it seemed that my phosphate levels were always going from too high as the GFO became exhausted, to too low when I replaced it. 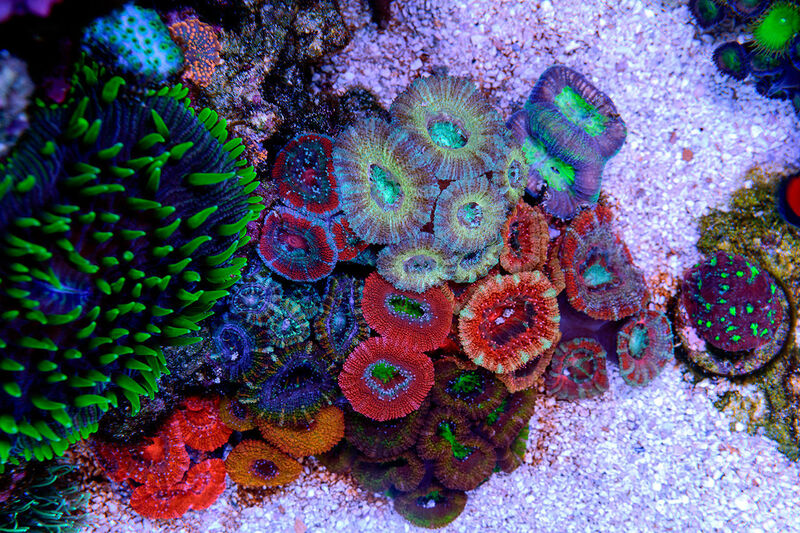 Using a very small amount (a couple drops) of PhosphateRx reduces phosphates by a small and predictable amount, and I can make adjustments slowly without shocking the corals with sudden changes in phosphate levels. 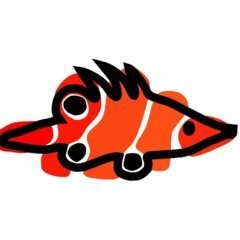 Finally, I think the most important thing is to be actively engaged here on the Nano-Reef Community. When I started planning this build, I hadn’t decided what size tank I wanted, whether to have a sump or not, what kind of lighting to use, and what kind of skimmer to use. Fellow N-R members gave me great answers to all my questions and made many suggestions that really made this tank become what it is now. It’s important to start a tank thread even if it’s just as a personal journal to help keep track of progress and changes. 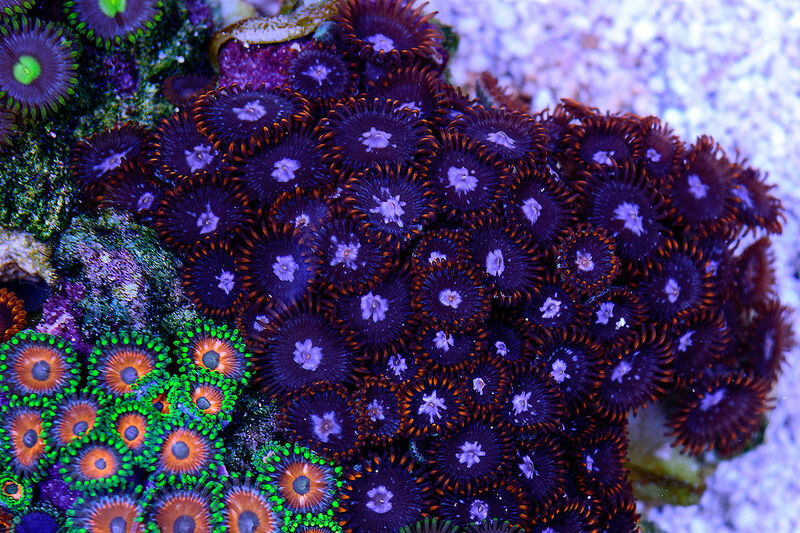 Take lots of pictures – it’s extremely rewarding to see the progression of the tank and the corals over time. And of course the encouragement from fellow N-R members is the best part about keeping a tank journal, especially when things aren’t going well, or even just getting boring. There is no magic formula to success in this hobby. Sump or no sump, LEDs or T5s or both, skimmer or no skimmer, there are successes and failures everywhere. Do your research carefully, and learn what the advantages and disadvantages are for every approach. 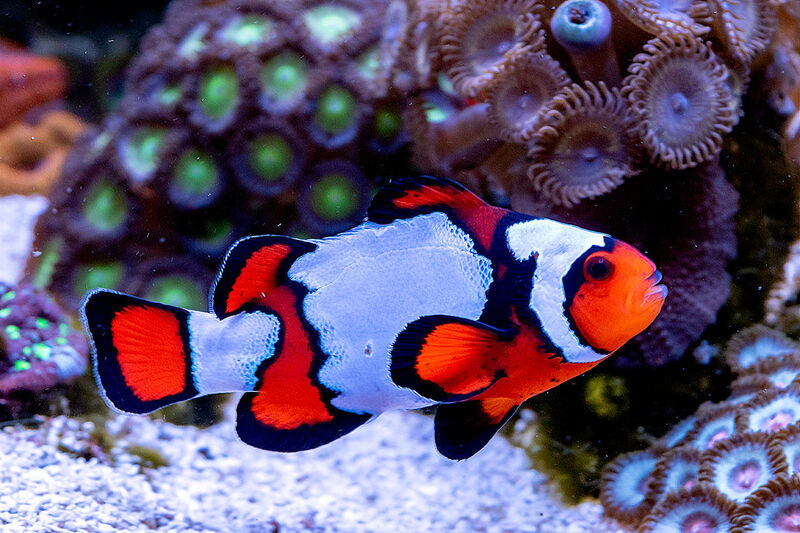 Usually when someone says “Do it this way…”, they mean “Well, this worked for me so it ought to work for you!” The best way to learn is to find an actual tank that you like here in the community, one that is set up the way you like too. Then ask the owner what they like and what they don’t like about the way they’ve built their reef, and what they would do differently. I found good ideas from many tanks here on N-R. @4x5 inspired the scape for this tank, @Nano sapiens inspired me to keep things simple (I failed miserably, but I was really inspired), @markalot inspired me to try the low-cost Sunblaster T5 lights that he used over his 40b tank of the month, and @Cannedfish inspired me with what may turn out to be the best tank thread of all time here on N-R. 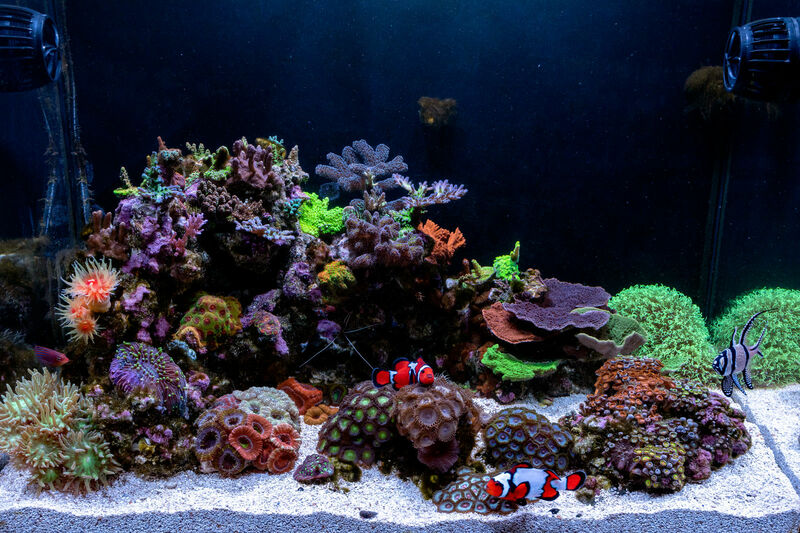 Thanks to all those that follow this tank and have been so generous with ideas and feedback, but especially Christopher Marks, who has tirelessly and faithfully made Nano-Reef a friendly and enjoyable place to learn about reefing. Congrats! 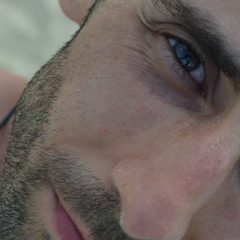 Your scapes and colors are always fantastic, well deserved! 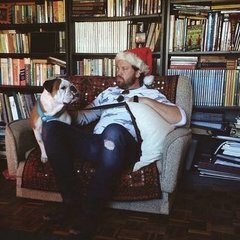 Looking good, congrats on the NTOTM! Well grease that owl, and flip me a flapjack! 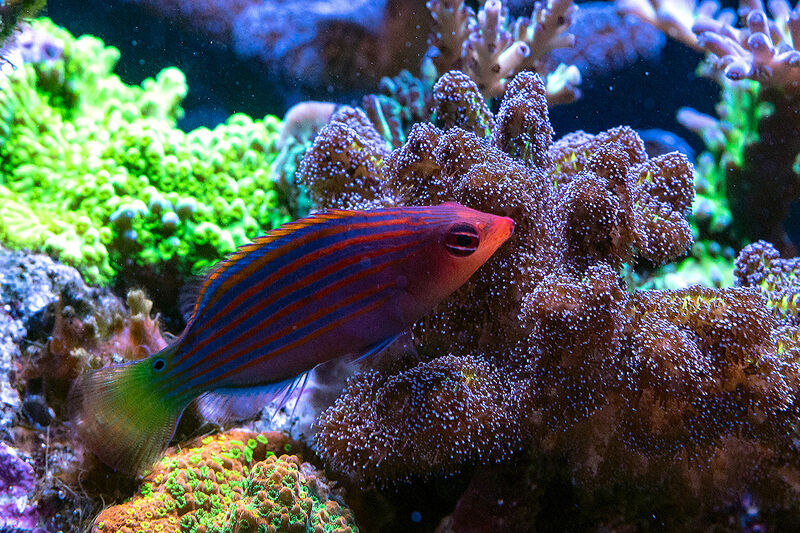 That's darn sure's one fine lookin' tiny reef! Three times TTOM winner!! Congrats! This tank definitely deserves it. As said before, all of your tanks and their threads are educational, inspirational, and otherwise set the bar for both what should be strived for and, simultaneously, what can be accomplished in this hobby through diligent care and good husbandry. 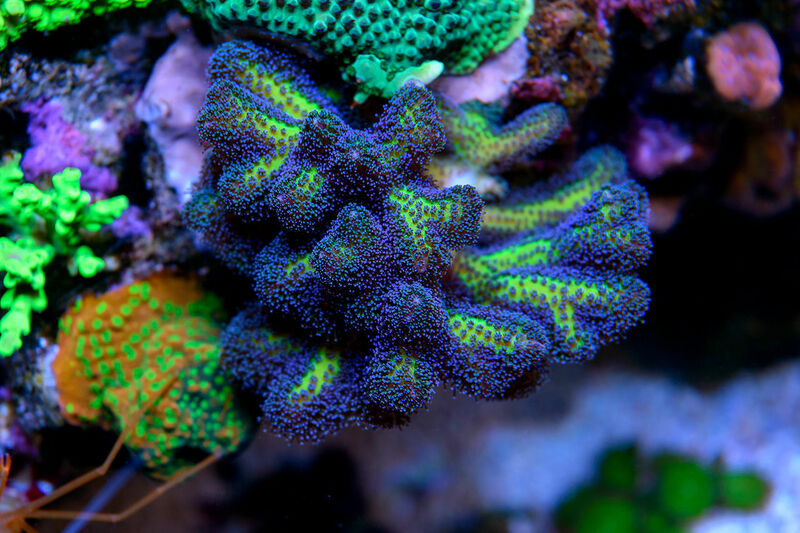 Furthermore, I must say this write-up in particular is great in that it paves a path for success for perspective hobbyist looking to dive into nano reefs. I should know, as my foray started from perusing through this sites TOTM's and being enamored by a similar tank (though only 10 gallons) that laid bare the groundwork that made me think that with a little luck and a lot of bourbon I could possibly have a similar tank. So again, congrats on the TOTM honor and knowing what an affect your tanks have had on my credit card statements!